May 7 is the Bakery to Brewery Ride in Waterloo | Vandewalle & Associates, Inc. EVENT SUNDAY MAY 7, 2017. 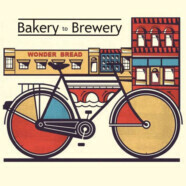 Hosted by Friends of the Hostess Wonder Bread Building, the third Bakery to Brewery Event in Waterloo begins at the new Waterloo SingleSpeed Brewing Co. on Sunday May 7 at 12:30 pm with biking, craft beer, and live music. The leisurely and family-friendly 16-mile ride itself starts at 1:00 and follows a route largely along the Cedar River Trail. After the ride there comes live music by Jes Raymond and the Blackberry Bushes at 3:00 pm, and a raffle at 5:00 p.m. The Hostess Wonder Bread Building has recently undergone extensive renovation and is now open to the public as SingleSpeed Brewery’s second location. Come celebrate SingleSpeed Brewing Co.’s new facility and the community-wide effort to help make it happen!